Tony Dow and Jerry Mathers as "The Beaver." Born on June 2, 1948 in Sioux City, Iowa, Jerry Mathers' acting career began at the age of two when he appeared in a Pet Condensed Milk commercial with Ed Wynn on The Colgate Comedy Hour. He graduated to film roles later in the 1950s, acting alongside Bob Hope, Shirley MacLaine, and Alan Ladd. He achieved lasting fame in 1957 when he was cast as young Theodore "Beaver" Cleaver on Leave It to Beaver. The classic sitcom's original run was for six years and 234 episodes. Today, it's still shown twice daily on MeTV and throughout the world. In 1982, Jerry Mathers reunited with most of the original cast for a highly-rated reunion movie called Still the Beaver. Its success led to a popular revival TV series known as Still the Beaver and later The New Leave It to Beaver. Jerry Mathers has also appeared as a guest star on numerous TV series, such as My Three Sons, The Love Boat, and Diagnosis: Murder. He made his Broadway debut in 2007 as Wilbur Turnblad in the Tony-winning musical Hairspray at the Neil Simon Theater. 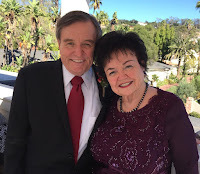 Diagnosed with Type II diabetes in the mid-1990s, Jerry Mathers has appeared before the Congressional Caucus on Diabetes and has spoken at numerous events about the importance of early diagnosis, diet and exercise, and the proper treatment for diabetes. Café: You were six-years-old when you appeared in Alfred Hitchcock’s The Trouble With Harry (1955). What are some of your memories of working with Hitchcock? Jerry Mathers with Shirley MacLaine. Café: What do you remember about working with Bob Hope as the young Bryan Lincoln Foy in The Seven Little Foys (1955)? Jerry Mathers: I wouldn't be here if it wasn't for Bob Hope. In The Seven Little Foys, there was a true-life scene in which there was a fire in a vaudevillian theater and Eddie Foy saved a lot of people's lives. In those days, they didn't have fire prevention systems and sprinklers. The vaudevillians used candles to light the stage. When they caught on fire, which wasn't often, people would get trampled on trying to get out. When we went to do that scene, I was at the side of a stage sitting in this catwalk and Bob Hope knew that I was up there. When he saw that they put too much gasoline on the curtain, he knew that I was in danger. Everyone else panicked and ran out like they were supposed to, but Bob Hope noticed that I could't get out. He threw a blanket over himself and ran through the flames and got me out. So, he actually saved my life. Café: You and Barbara Billingsley were the only cast members retained from the original Leave It to Beaver pilot. What led to the roles of Ward Cleaver (played by Max Showalter) and Wally (Paul Sullivan) being recast? Beaver and the original Wally. Jerry Mathers: I know that the boy that was to play Wally had a growth spurt. When they brought him back several months later, he had gotten really big--and really looked like a big brother. He was almost as tall as Hugh Beaumont, who was 6' 1". Tony Dow hadn't really worked as an actor. He was an AAU diver training for the Olympics. He had been in a pilot for another series called Johnny Wild Life because of his swimming and diving abilities. It was kind of a take-off on Tarzan. His mother took him on the second interview for Leave It to Beaver and he got the part of Wally. The producers were looking for someone very athletic and that was definitely Tony Dow. As for the part of Ward, the producers did several screenings. They'd bring in people from the outside as well as people working in other shows on the lot. They'd administer a questionnaire asking how you liked each character. For some reason, they decided to replace both of the actors who played Wally and Ward in the pilot. Café: Didn’t your mother play a part in Hugh Beaumont getting the role of your TV father? Jerry Mathers and his mother Marilyn. Jerry Mathers: My mother Marilyn is 91 and she is amazing. She has always been and continues to be so supportive of my career. Yes, she did play a big part in Hugh Beaumont getting the role of Ward. I worked with Hugh before Leave it to Beaver when we filmed a promotional commercial for Rose Hills Memorial Park. My mom liked Hugh very much and told him at that time the producers of a television series that I had just been hired for, Leave it to Beaver, were looking to cast the father. She thought Hugh would be perfect for the part and encouraged him to audition. And as they say, the rest is history! What many people don't know is that Hugh Beaumont wasn't really an actor, he was a Methodist minister. Before Leave It to Beaver, his most famous role was as private detective Michael Shayne in a series of "B" movies that played before feature-length films. Michael Shayne was a very mean character. To get people to talk, he would pound them against a wall. He was a very aggressive private detective. That wasn't really what Hugh Beaumont's personality was. So when he got to Leave It to Beaver and would take Beaver into the library or den and tell Beaver that he shouldn't have done something--that was much more Hugh Beaumont reverting to the preacher that he really was. Café: How would you describe a typical day on the set of Leave It to Beaver? Jerry Mathers: It was 39 weeks a year and we'd go out after that for a few weeks of promoting and meeting with advertisers in New York and Chicago. We'd come back for a short vacation and then start filming the new season. We did that for six years and 234 shows. A typical week started on Monday. We'd go in and read the script. For the first few years when I wasn't that good a reader, they would have someone read my lines and I'd listen to them. It was a very good time and everyone was very nice. Café: I know this is a difficult question since there were over 200 episodes of Leave It to Beaver, but what are your two or three favorite episodes? Beaver in the giant soup bowl. Jerry Mathers: I like the one where I climb up into the soup bowl. That was fun. They actually built a billboard on the backlot of Universal. So for the outdoor shots, I was up there for about half a day. I got to miss a lot of school for that one. Of course, I had to make it up the next week by doing more hours. The show was just a grand adventure with a lot of adults around and we just had a really good time. After I'd do my schoolwork, I'd work on models that kids were building at the time. We'd play catch during lunch. It was just always a fun place to be every day. Café: My wife and I loved Beaver’s friendship with Gus, the fireman. Burt Mustin, who played Gus, appeared in 14 episodes. Why do you think his friendship with Beaver resonates so strongly? Jerry Mathers: What many people don't know is that Burt Mustin's acting career actually started at the age of 67 after film director William Wyler cast him in the 1951 film Detective Story. Burt spent most of his early working years as an insurance salesman and he also had a degree in Engineering. As for Gus, I think he's kind of like a grandfather figure or the wise old man. He may be right or may be wrong--the kind of a sage that a lot of people wish they had. I had several of them on the set. Hugh Beaumont was a Methodist minister. A lot of people say he was such a good father figure. He was used to doing things like that. Café: After Leave It to Beaver (1957-63) ended, did you stay in contact with any of the actors who played Beaver’s friends? 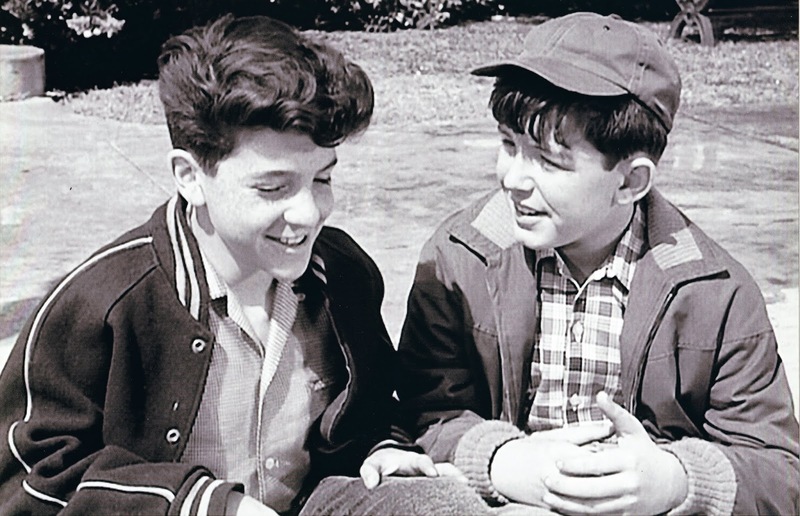 Richard Correll and Jerry Mathers. Jerry Mathers: Richard Correll, who played Beaver's school friend Richard Rickover, and I are lifelong friends and often see each other at family gatherings. Rich is a very accomplished television director and producer and has directed over 700 shows. I would see some of the others sometimes, but not as often as when we were doing the show. A lot of people don't realize that Los Angeles is very, very spread out. I couldn't drive at the time, so when Leave It to Beaver ended, we all went back to our homes. When we were teenagers, we all became close friends. Richard was friends with Harold Lloyd, the great silent film star. He had a daughter and we'd go over there and he would show us movies. It was a really good time for me. I had a wonderful childhood. Café: The New Leave It to Beaver (1983-89) had a very successful run with 102 episodes. How would you compare it to the original Leave It to Beaver? Jerry Mathers: It was really fun to be able to go back and see people like Barbara Billingsley. Sadly, Hugh Beaumont had passed. We hired several people who were in the original show and even the crew, who were still in the business. It was interesting to accept the role of the father in the show in place of Hugh Beaumont. Those were very big shoes to fill and try to play the same part. But it was interesting to move from the part of the boy to the part of the father. Café: Since you were diagnosed with type 2 diabetes in the mid-1990s, you have been actively involved in diabetes awareness and education. What kind of information do you share with people living with diabetes? Jerry Mathers: I try to share with them that it's something a lot of people have. There's Type 1, which you're born with. Type 2 is the kind I had and I had it because I was overweight. At the time, I had invested in several businesses, one of which did catering so that I put on a lot of weight. That contributed to my diabetes. I was lucky enough to catch it early and when I took off the weight, I was prediabetic. I never had to take insulin. But I'm prediabetic for life so I always have to watch my weight. Café: You stay pretty busy! Do you have any other upcoming events you’d like to share with our readers? Jerry Mathers: I do a lot of personal appearances all over the country. You can go to my web page, which is JerryMathers.com and that's the best way to see what I'll be doing. And you can also check my Facebook page: The Jerry Mathers. That's the best way to find out if I'm going to be in your area. 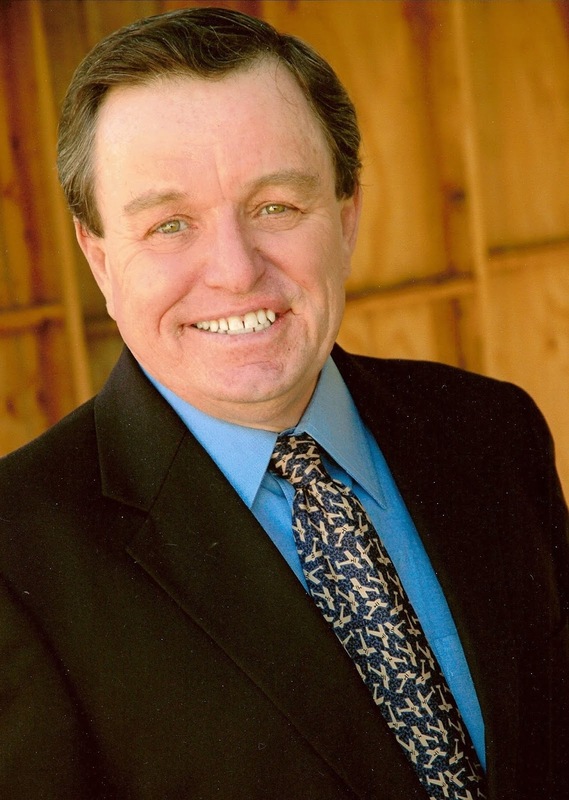 In addition to his web site and Facebook page, you can also follow Jerry Mathers on Twitter and Instagram. A grand interview, as always and Jerry Mathers is a grand subject. Mathers is a fine ambassador for The Beav. Not a great film but he was effective in '57's, "The Shadow in The Window," who witnesses a murder and goes into shock. How nice to catch up with "the Beav"! Great interview Rick. Happy to know that working on the series was so much fun for him, and also that he enjoyed working with Hitch. My brother and I watched Leave it to Beaver faithfully, it was our favorite of all the family sitcoms of the era (Father Knows Best, Danny Thomas, etc.). What a shelf life that series has had! 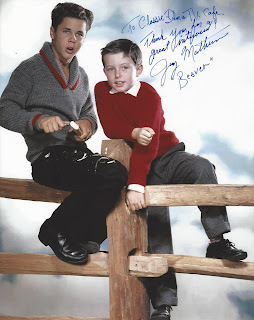 Jerry Mathers was one of the most natural child actors ever! Loved him on "Leave It to Beaver" and in "The Trouble with Harry." I haven't seen the Bob Hope film, but that's quite a story. What an interesting interview! Really enjoyed it! Great job! I truly enjoyed reading this fascinating interview! Like The Lady Eve I adored “Leave It to Beaver” and watched it faithfully, though as an adult. Jerry Mathers and the cast made the stories come to life on the TV screen! I loved all the photos, but especially the one of Jerry with his mother. She had great instincts about her son and Hugh Beaumont. It was great to hear about Jerry’s interactions with Hitchcock and I was thankful to read how Bob Hope watched out for him and saved him from the out-of-control fire. Most of all it made me glad to hear how he learned his lines when he was very young and that he had a happy childhood. Jerry Mathers sounds like a lovely gentleman and it was very kind of him to share his experiences with you and all the readers at the Cafe! Thank you! Some other characters were Fred Rutherford(RICHARD DEACON), Clarence Rutherford, better known as Lumpy(FRANK BANK),and Eddie Haskell(KEN OSMOND). There were also Miss Landers. Miss Canfield and the principal Mrs. Rayburn. Gilbert Bates and Larry Mondello and Larrys mother . Judy, Mary Ellen Rogers and Julie Foster. What a cast! I want to add to my above post that there was also Violet Rutherford played by, I believe, Veronica Cartwright. I think another actress also played the part one time. I remember guest stars Ryan ONeal and Barbara Parkins (in different episodes). They both would go on to the prime time soap PEYTON PLACE. Really entertaining interview with some great questions. My brother sometimes watches reruns on MeTV, and we were just discussing the episode where Beaver climbs into the bowl of soup on the billboard. I didn't finish my post. I meant to say just as well as Mary Ellen, even better sometimes. Julie as played by a pretty and likable blonde named CHERYL HOLDRIDGE who had been on THE MICKEY MOUSE CLUB. I believe that she was married to Barbara Huttons son Lance who was once married to Jill St.John. By the way Miss Hutton was an heiress who was once married to Cary Grant. WHEW!! Great stories and memories. You have a way of drawing the most interesting observations out of your interviewees. The mild mannered principal Mrs. Rayburn was played by Doris Packer. At the same time, she also played a diametrically opposed character; a fiesty, mean and 'nasty' "Clarissa Osborne" mother of "Chatsworth Osborne, Jr." in The "Dobie Gillis" TV series. What an actress to be able to do such extremes. I loved this show. Still watch on Utube. Bless you Jerry. Wonderful interview! Jerry Mathers' performance as Theodore "Beaver" Cleaver is delightfully compelling. How he managed to bring to life a little guy who is so natural and lovable is a great acting feat and Mather's does it effortlessly. Leave it to Beaver is my happy go to place, and it is undeniably timeless. Thank you for paying tribute to an icon! Joey- who is not a creepy girl. Perfectly put, MY happy place as well! Good interview. I never heard about the Bob Hope story. I love these interviews, they are like time machines that take us back to a better time!